The custom of sending Christmas cards was started in the UK in 1843 by Sir Henry Cole. Sir Henry had the idea of Christmas Cards with his friend John Horsley, who was an artist. They designed the first card and sold them for 1 shilling each. I love sending cards out everywhere and people ask me why don’t I just email? It’s not the same! I enjoy reaching out to people I rarely hear from, close friends, family and new acquaintances…. there is just something about this tradition I won’t let go of. This year I decided to use one of my winter photographs and it takes me back exactly to that moment in time when I jumped out of my car in a blizzard, grabbed my camera and ran into six feet of snow to get that perfect shot. It thrills me to look at it and I can feel the frost on my lips and nose. I can hear that Moose breathing heavily, and just hoofing it across that prairie pasture. Time literally stood still for me. That’s what a Christmas card means… bringing a feeling of joy and love…from me to you. 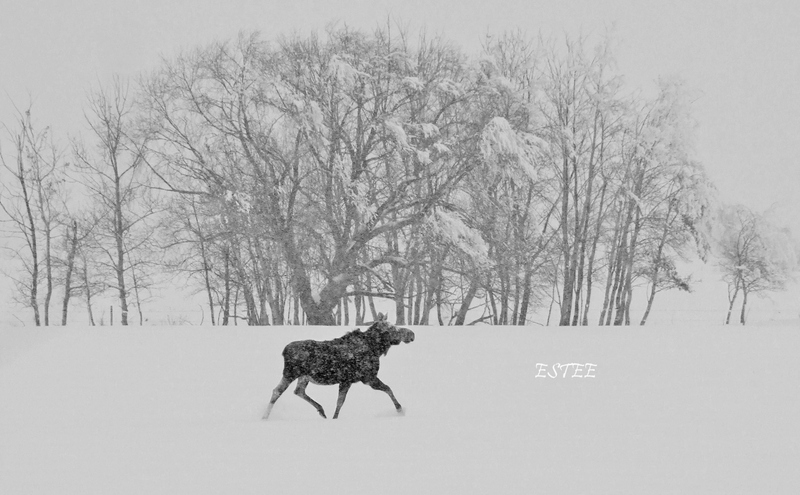 This entry was posted in love and poetry and tagged christmas cards, love, merry christmas, moose, photography, Saskatchewan, snow and ice. Bookmark the permalink. Love your Christmas card Estee and the story how you got your shot! Best of the season to you. Back at you Julia… thank you!